One of these foods is healthier than the other — and the answers may surprise you. Every time we go grocery shopping or sit down to eat, there are choices to make. Which cereal are you going to throw in your cart? Which milk? Different days and personal needs may call for different things, but if you want to know what’s generally healthier, I have answers. First, test your nutrition know-how to see you fare. Then, find out what you need to know about how to make better choices. 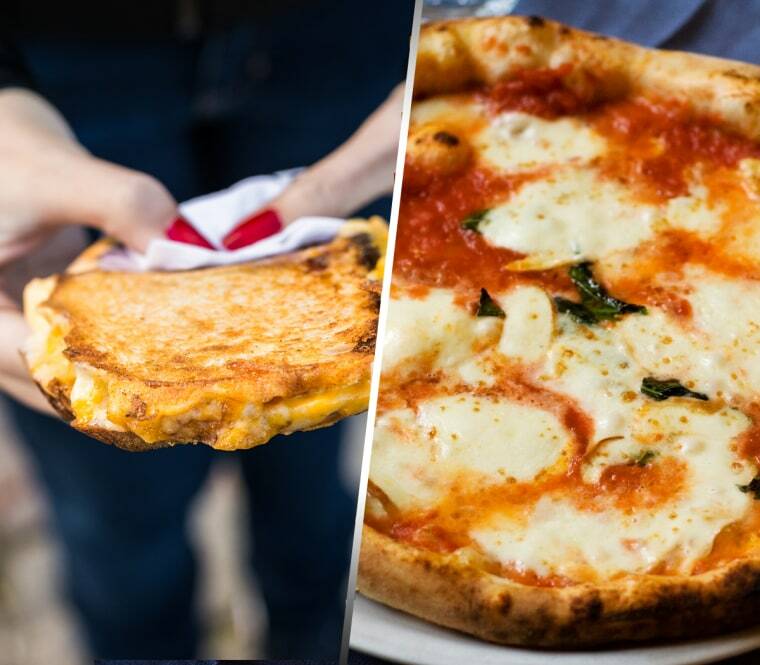 Cheese pizza or grilled cheese? The winner: It's a little complicated because neither of these comfort foods scores major health points. If your dinner decision-making process involves ordering pizza delivery or scrounging up something in the fridge, grilled cheese wins, but only if you're reasonable with the butter and cheese. The reason it edges out pizza is about portion size. Few people double up on grilled cheese, yet many happily grab two slices of pizza, so the grilled cheese will keep things lighter. Here's the exception to the homemade grilled cheese rule: Making pizza with a whole wheat crust, piling on the veggies, and sticking to a slice would give it the advantage because veggies are always a plus, and the whole grain crust is a good delivery vehicle for these nutritious additions. And if you're at a restaurant that offers veggie pizza with a whole grain crust, order that instead of the grilled cheese, which is most often a calorie bomb made with white bread and unreasonable amounts of cheese. Do It BETTER: To make your grilled cheese even better, serve it on whole grain bread and use plant-based oil, like extra-virgin olive oil. These two ingredients give this meal an upgrade thanks to the extra bit of fiber and healthy plant compounds. The winner: The 2% Greek yogurt is my hands-down choice. It may seem counter-intuitive to recommend the higher-calorie, higher-fat pick, but the latest evidence suggests that people who consume these foods have a lower chance of being overweight or obese, and research points to a lower risk of diabetes from high-fat dairy foods. Plus, the evidence connecting saturated fat from dairy foods to health concerns has weakened over time. Another pro: You won’t find any additives, added sugar, or artificial sweeteners in plain 2% Greek yogurt. Do it BETTER: For those that want fruity flavor or like their yogurt on the sweet side, your best bet is to start with a plain variety and then dress it up with fruit and a drizzle of honey or maple syrup. You’ll get whole, fiber-rich fruit, and chances are, you’ll add less sweetener than the manufacturer. Which is healthier: A hot dog or hamburger? Honey Nut Cheerios vs. Frosted Flakes? The winner: Neither of these options get top honors in my book, but in the battle of the sugary cereals, Honey Nut Cheerios edges out its competition. Though it contains 9 g of sugar — that’s over 2 teaspoons (and too much for a breakfast cereal!) — the first ingredient is whole grain oats, so you’ll get 2 grams of fiber from this choice. The Frosted Flakes has an extra gram of sugar (for a total of 10 g) and is made from milled corn, which is another way of saying processed, fast-acting carbohydrates. Do it BETTER: The actual winner is a 100% whole grain cereal with no to little added sugar. Less than 6 g of added sugar per serving is a good target. The winner: Honey has it slightly — but not because of its nutritional properties. Honey has some well-studied therapeutic benefits. It acts as a topical antibiotic when applied to wounds and eases nighttime coughs better than traditional over-the-counter medications. Honey also happens to taste sweeter than sugar so you may be able to get away with using less. But remember that honey is metabolized in the body the same as table sugar so there are no big nutritional wins when it comes to eating it. Do it BETTER: You shouldn’t be eating too much added sugar from any source, including honey. And honey won’t provide these health benefits unless you’re using it as specified to treat these conditions. That means that a daily drizzle over your oatmeal won’t do anything for that nighttime cough. You’ll need a spoonful at night for that. So keeping tabs on your honey consumption still applies. Plant-based milk vs. cow's milk: What's the difference? The winner: For those who consume dairy foods, milk has more nutrition per cup. It has 8 grams of protein —that’s more than a cheese stick, an egg or an ounce of almonds. Almond milk has just 1 g of protein. Plus, the calcium in milk is naturally-occurring and it may be more protective than the calcium that’s added to plant-based varieties. Do it BETTER: Unsweetened almond milk has just 30 calories per cup compared to 110 calories per cup of 1% milk. If you’re getting protein from other sources (like yogurt, nuts and nut butters, eggs, beans, meat, chicken, and fish), you might prefer a lower-calorie way to lighten coffee or round out your smoothies and oatmeal. The winner: A smoothie has a leg up on the green juice, despite the fact that celebrities and other so-called health enthusiasts pay premium prices for their green sips. Smoothies are made in a blender, which pulverizes whole fruits and vegetables. This process not only retains the vitamins, minerals, antioxidants and other health-promoting plant compounds, but also the fiber — something lacking in most Americans’ diets. Plus, smoothies tend to be made with other beneficial ingredients, like nut butters, protein-packed Greek yogurt, chia seeds, and the like. So in addition to all the nutritious goodness from produce, you’re getting added nutrition from the extras, while also getting a drink that’s filling and satisfying. Though green juice is rich in nutrients, juicing machines separate the pulp from the fruit juice, leaving the fiber behind. This is a big health miss, and also means these drinks won’t do as good a job filling you up. Also, because greens are bitter, green juices often contain more fruits than veggies, which drives up the calories, carbohydrates and sugar. Do it BETTER: Though I generally favor whole fruit over juice (green or otherwise), if you’re really struggling to get enough produce and want to give green juice a try, remember that it’s a concentrated source of nutrition and calories. Keep your sips small — much closer to a shot glass than a big gulp. And, watch your smoothie intake, too, because those extra calories can add up.